A delicious mix of Sweet & Savory items that is perfect for any occasion. 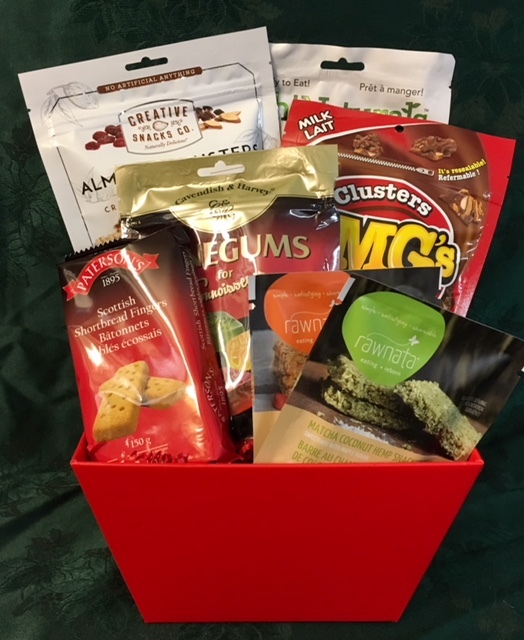 Small Contains: Oh Natural's Crisps, delectable Almond Clusters with Cranberry & Cocoa Nibs, OMG's Chocolate Clusters, Winegums, Somersaults Sunflower seed snack, Shortbread, Rawnata Snackers. 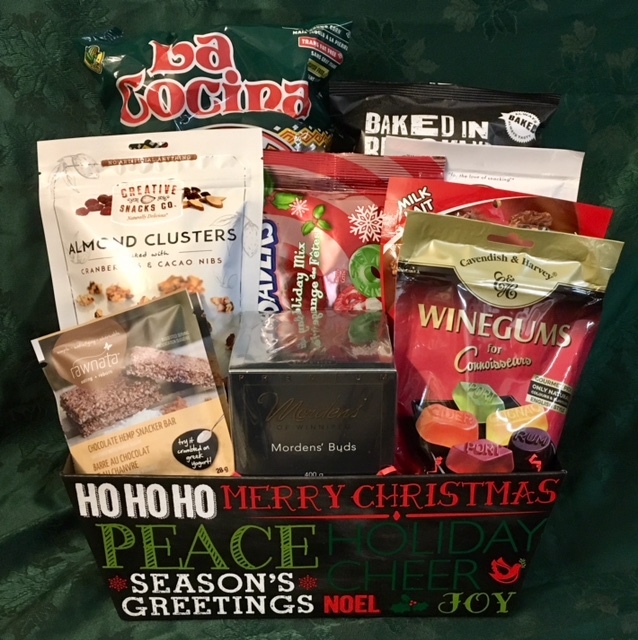 Medium Contains: Flatbread Crisps, La Cocina Tortilla Chips, Morden's of Winnipeg Rosebuds, Oh Natural's Crisps, Almond Clusters, OMG's Chocolate Clusters, Winegums, Somersaults Sunflower seed snack, Lifesaver assorted Holiday flavors, Rawnata Snackers. 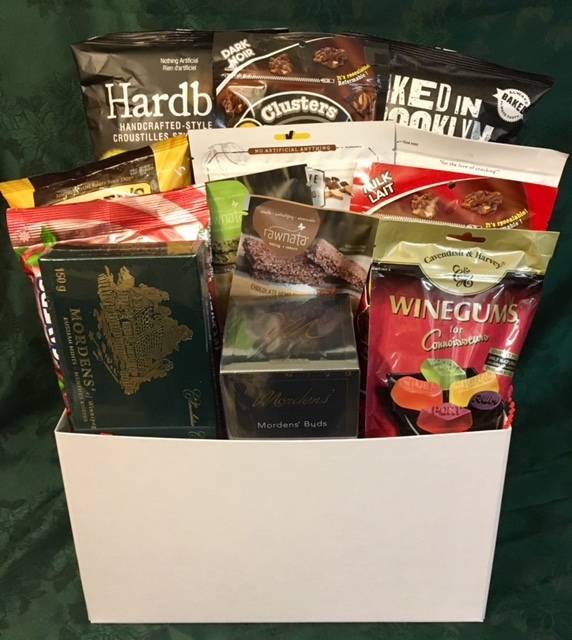 Large Hardbite Chips, Pita Crisps, OMG's Milk, OMG's Dark, Almond Clusters, Oh Naturals Crisps, Morden's of Winnipeg Rosebuds, Morden's of Winnipeg Russian Mints, Snyders Pretzel Chunks, Winegums, Rawnata Snackers, Lifesaver Holiday flavors. 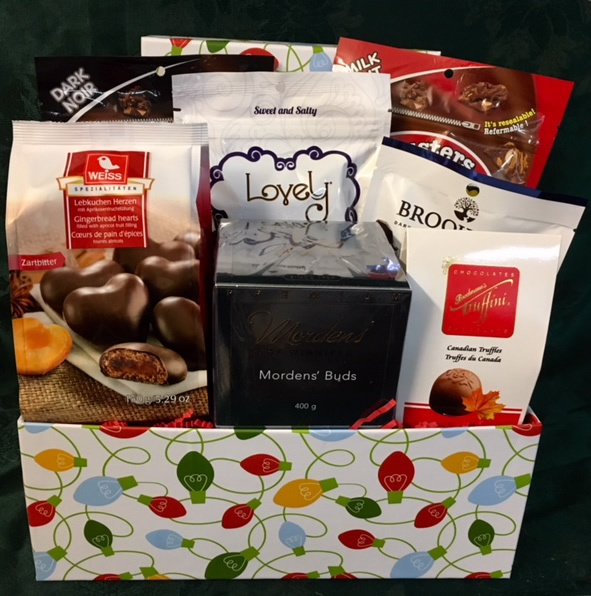 These baskets are overflowing with all things chocolate!! Made in Manitoba! 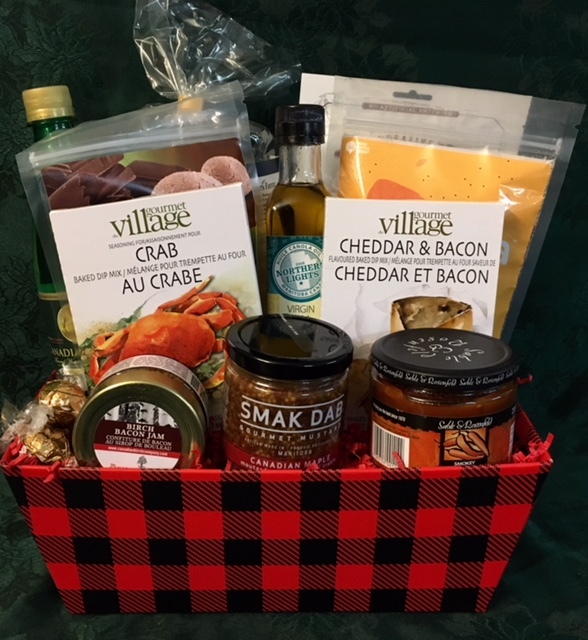 Give the gift of locally produced food products – a gift that all will use and that you can feel great about giving. By purchasing these products, you support the many businesses in Manitoba who invest huge amounts of time and money into providing safe, sustainable food products. A sampler of some of our favorite Manitoba goodies. Perfect as a thank you or to send to an ex pat! 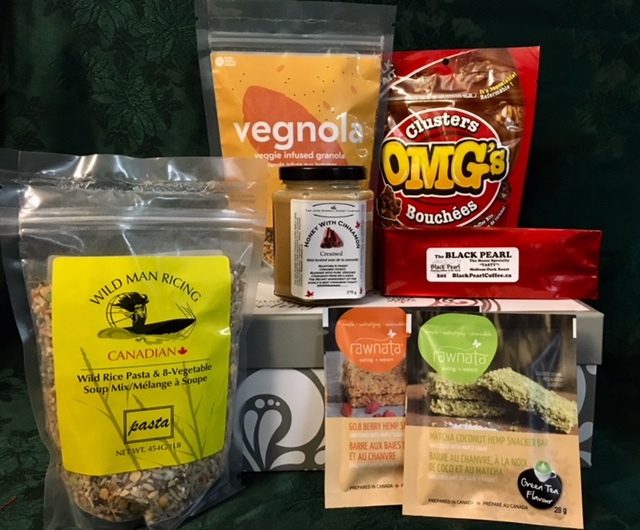 Includes: Vegnola – delicious blend of oats, veggies and other goodies (no one will know you're eating veggies), Wildman Ricing Wild Rice & Vegetable soup/pilaf mix, OMG's Chocolate clusters, John Russel Creamed Cinnamon honey, Black Pearl Coffee & Rawnata Snackers. Oh my! So many goodies all contained in a special keepsake box. 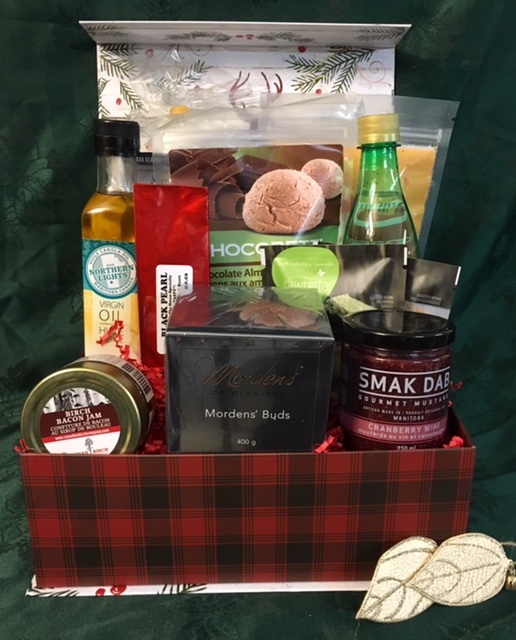 Contains: Nature's Pasta, Vegnola, Piccola Cucina Macaroons, Morden's of Winnipeg Rosebuds, Canadian Gold Sparkling water, Black Pearl Coffee, Smak Dab Cranberry Wine Mustard, The Canadian Birch Company Birch Bacon Jam, Rawnata Snackers. One can never have too much of a good thing! 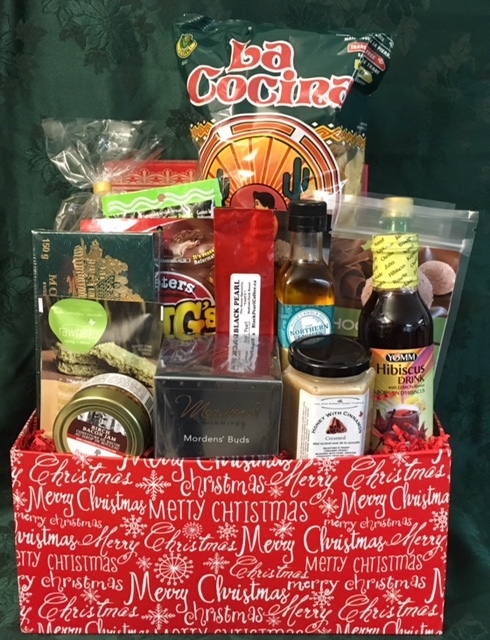 Includes: Nature's Pasta, La Cocina Tortilla Chips, Vegnola, Piccola Cucina Macaroons, OMG's Chocolate Clusters, Morden's of Winnipeg Russian Mints, Morden's Rosebuds, Canadian Gold Sparkling water, Yomm Hibiscus drink, XV Cold Pressed Canola Oil, Black Pearl Coffee, Wild West Seasonings, John Russell Honey, Birch Bacon Jam, Rawnata Snackers. 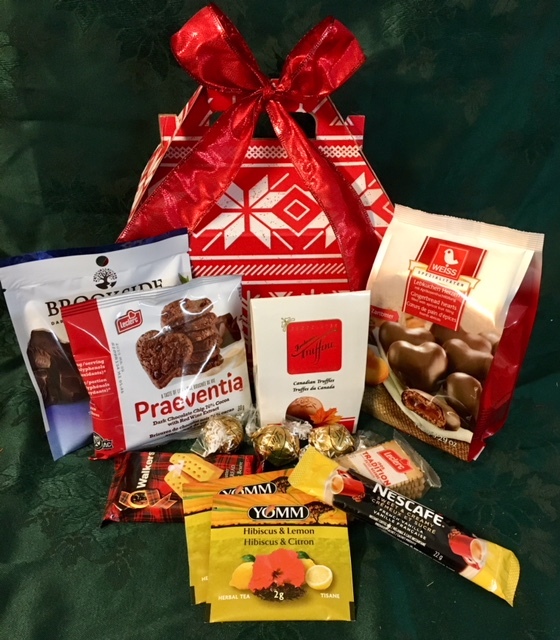 A perfect gift for the foodie on your list (or yourself)! 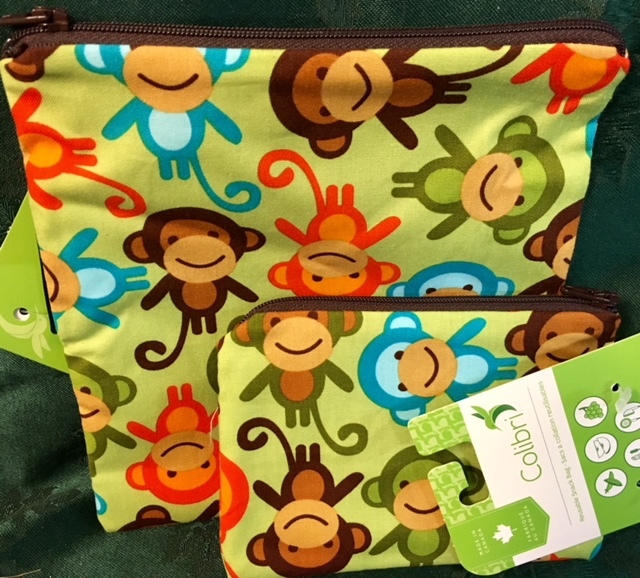 A perfect gift to celebrate any occasion! 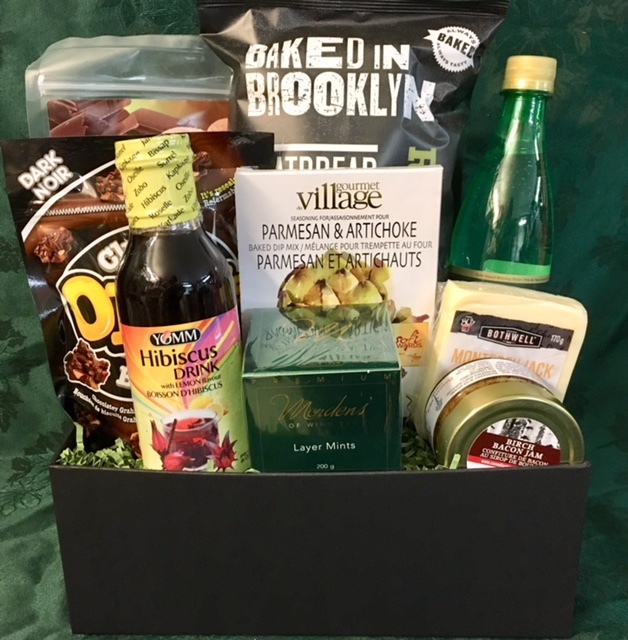 Contains: Pita Crisps, Piccola Cucina Italian Macaroons, OMG's Dark, Canadian Gold Sparkling Water, Yomm Hibiscus drink, Gourmet Village Dip mix, Birch Bacon Jam. Morden's Green Layer Mints, Bothwell Cheese. 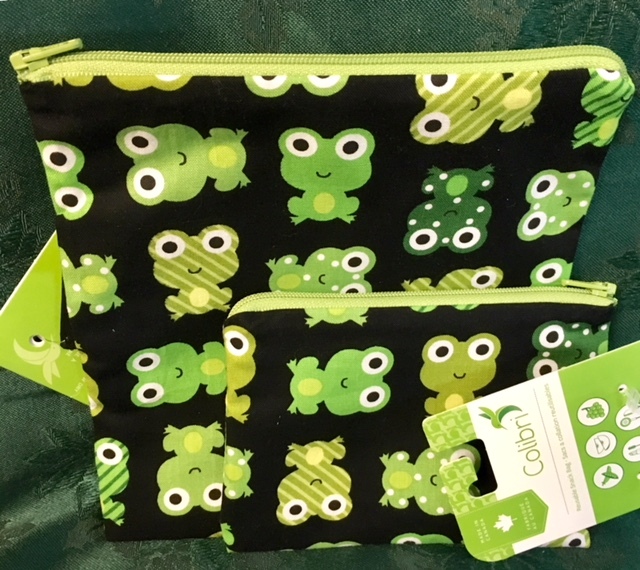 A perfect little gift for someone to enjoy on Christmas morning! 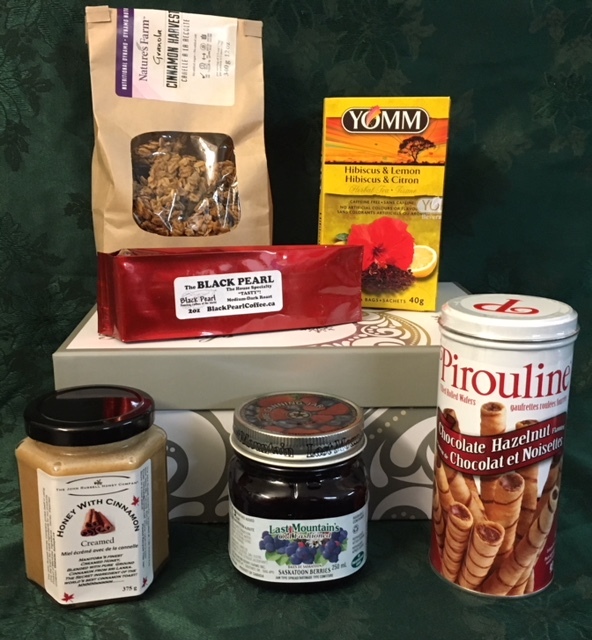 Contains: Nature's Granola, Yomm Hibiscus Tea with Lemon, Black Pearl Coffee, John Russell Honey, Saskatoon Jam and a sweet treat – Pirouline Wafer Cookies. 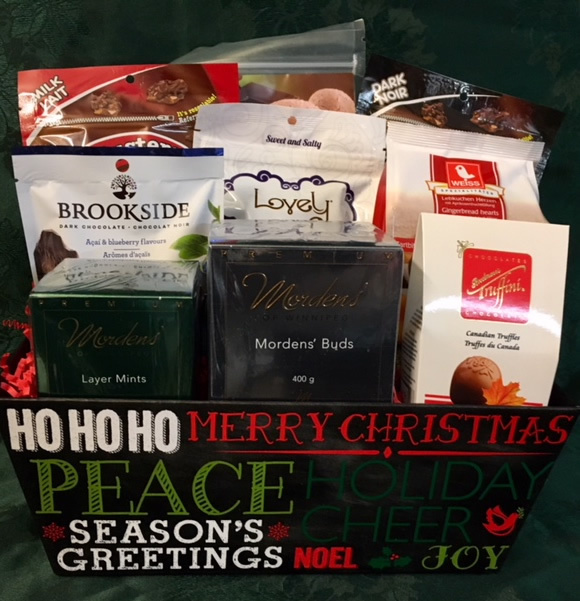 This cute little box reminiscent of a knitted holiday sweater is full of goodies to make the recipient feel all warm inside! 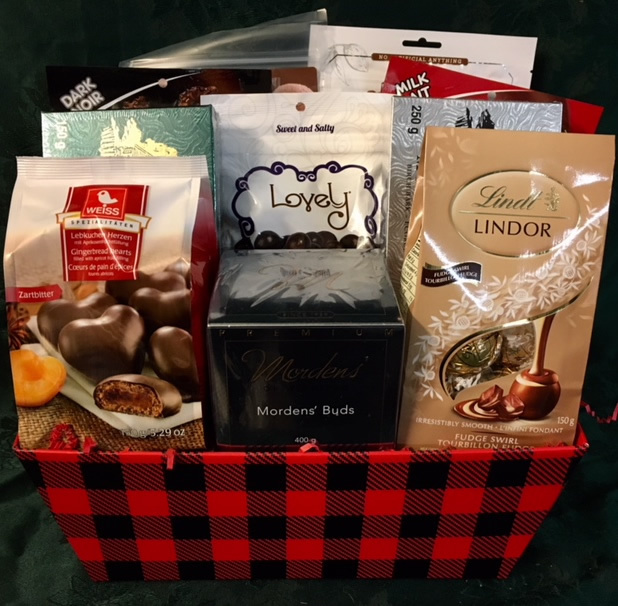 Contains: Chocolate Covered Gingerbread, Brookside Chocolate Fruit, Trufinni Truffles, Chocolate Heart Cookies, Shortbread, Leclerc Biscuits, Yomm Hibiscus tea, French Vanilla instant coffee and Lindt Truffles. Know someone who fidgets or needs to always keep their hands busy? 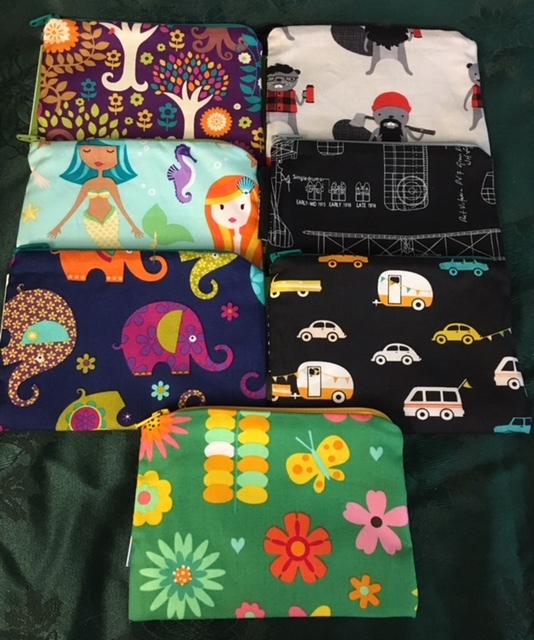 Does someone you know have sensory challenges? 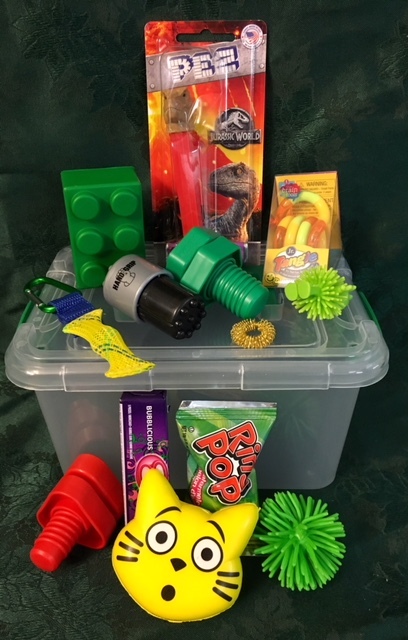 We've put together this fun collection of sensory items to help get through the day! 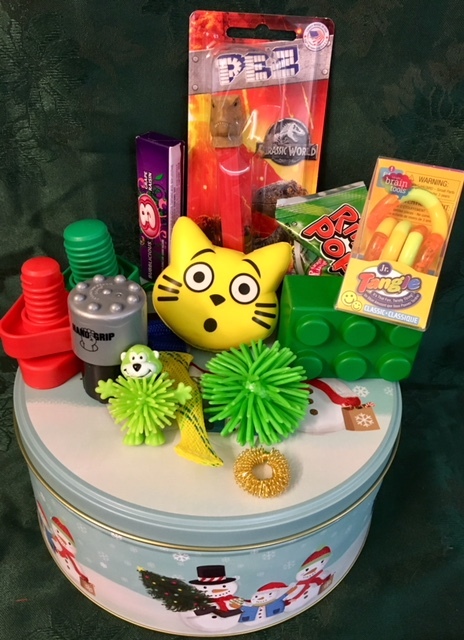 Contains: Set of 2 Nuts and Bolts, Tangle Junior, Lego Stress ball, Emoticat Stress ball, Handgrip, Jumbo Porcupine Ball, Mini porcupine animal, Boinks Marble fidget on a carabiner, Finger massage ring, Pez, Ring Pop, Bubbalicious Gum. Please specify Holiday Tin or Bin with snap lip. 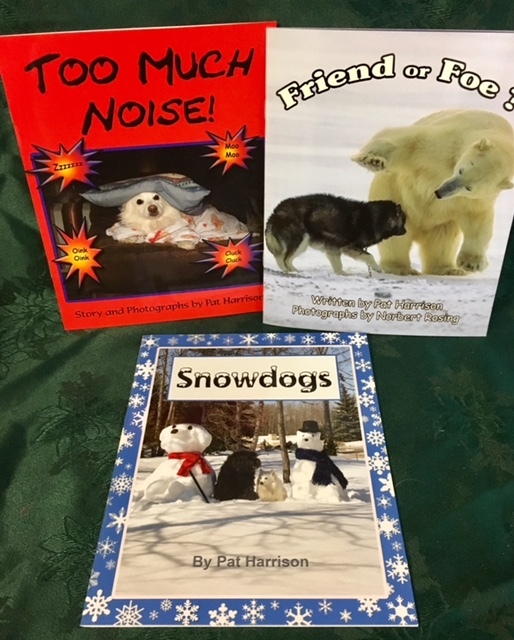 Blueberry Hill Books Levelled reading books that feature Fluffy & Charlie. 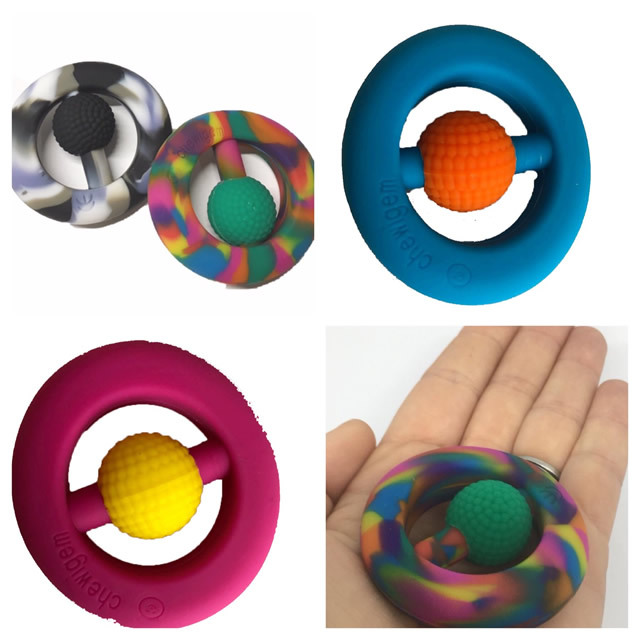 Chewigem Chewable Hand Fidget Discreet silicone hand fidget with a variety of textures and safe to chew!